There will be no midlife crisis for this first lady. As Michelle Obama celebrates her 50th birthday Friday, she says she's never felt better. And she has the track record to prove it. Widely regarded as strong, smart, and poised, she has a reputation for being warm and gracious — while accomplishing her own agenda. She and President Obama seem like they have a genuinely loving relationship, with the First Lady serving as his backbone and keeping him down-to-earth. Michelle Obama has been very vocal about projects dealing with obesity, military families, and education. However, it's a bit hard to pinpoint her specific accomplishments as first lady, because she often gets so much media coverage based on what J. Crew jacket she wore this week, which TV show she's appearing on, or whether she plans on shopping at Target again anytime soon. If you ask Mobama herself, she says she considers her first job to be that of mother to Malia and Sasha. She teaches her daughters to be strong and self-sufficient — getting them to make their own beds every day, while giving them space to figure themselves out. Coolest mom in the country. 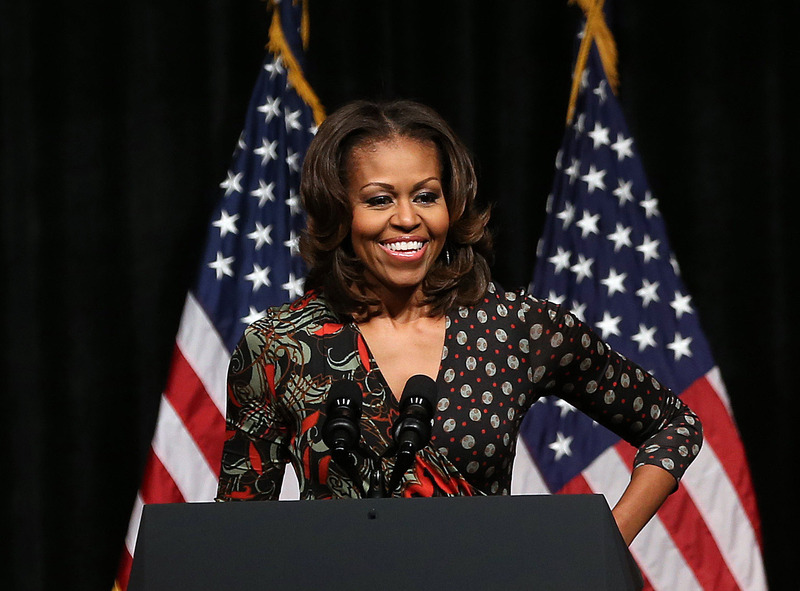 Michelle Obama regularly crusades for greater rights for women around the world. In 2009, her influence was felt when President Obama signed his first legislation, the Lilly Ledbetter Fair Pay Act, leading one historian to remark, "I don't recall any first lady getting off to this quick a start." While in Africa in 2011, Michelle Obama implored leaders to stop treating women like "second-class citizens" and to open up education opportunities and AIDS/HIV information for women. She's hosted mentorship gatherings at the White House for young girls to connect them with business owners and actresses like Hilary Swank. 2013 was the year that Michelle Obama got social media-savvy — or her office did, at least. Exactly one year ago, her team sent out the first tweet from @FLOTUS for her birthday. She joined Instagram in June with a photo of young women at a school in Africa. Personal tweets and 'grams from Obama are signed "-mo." The first lady is no stranger to taking candid photos, including this adorable selfie with Bo the dog. But Instagram also let us see her with an old-school Flock of Seagulls-esqe 'do in of her #ThrowbackThursday pics. I'd be nervous eating a potato chip in front of the first lady. In 2010, Michelle Obama launched her Let's Move campaign to deter childhood obesity, which affects one-third of American kids. It encourages kids and their families to eat healthier and to pry themselves away from electronic gadgets long enough to go outside and play. She even wrote a book about the White House Kitchen Garden. And it might actually be working, as a study from the USDA just found that more Americans are eating out less and consuming fewer calories. She even dances for the cause. Plus, Obama got to meet the characters of Sesame Street (lucky!) to help her out with the healthy-eating initiatives. As noted on her Instagram, "'It's about showing our kids that healthy food can be fun' —FLOTUS on a new commitment from Sesame Workshop and the Produce Marketing Association." Michelle Obama tried to teach a wigged-out Jimmy Fallon how to dougie in the "Evolution of Mom Dancing" video, but it didn't really work. Still, memorable. Another one of the first lady's personal projects is called Joining Forces, which helps veterans find jobs after coming home from war. Mrs. Obama says the country needs to be "a safety net" for military families, and about 2,000 companies have hired or trained 125,000 veterans or military spouses as of 2012. As a self-proclaimed advocate for gay and lesbian rights, Obama has also welcomed openly gay military members into the initiative. Michelle Obama may have singlehandedly brought the phrase "throwing shade" into the average American's vocabulary. Just watch her reaction to Speaker John Boehner's comments that may or may not have been about President Obama's smoking habits. And she looks pretty pissed off while the president joked around with Denmark's Prime Minister Helle Thorning-Schmidt and took selfies at Nelson Mandela's funeral. Last but not least, last January, Michelle Obama got bangs and the world FREAKED. The forehead fringe even inspired a few parody Twitter accounts. Keep up the good work, FLOTUS.